The springs in your garage door are essential to your system; they basically do all the heavy lifting. These parts are put under a lot of pressure with each use so it’s no surprise that they eventually begin to suffer from wear and tear. Our technicians can help extend the life of your springs with professional maintenance, and can quickly replace them if they're broken. Many overhead doors these days use torsion springs. They’re tougher and safer than the alternatives, and provide a smoother operation. 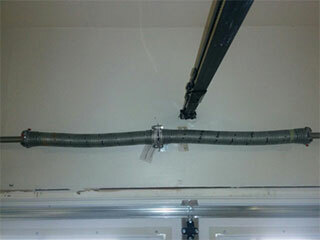 However, extension springs are cheaper, and require less headroom - they’re often used in garages with low ceilings. Ultimately the choice of spring for you will depend on your property needs; we can help provide advice on the best options available. These parts are expected to wear out over time, but regular maintenance will significantly extend their lifespan. Our technicians will apply lubrication to your spring coils and fixing points, and ensure they’re moving smoothly and protected from corrosion. We'll also carry out any adjustments if necessary, ensuring that the correct tension is applied to your door when lifted. If one of your extension springs snaps, they will both need replacing in order to maintain an even balance on the door. Our technicians will quickly and safely position your door, disconnect the broken components and replace them with new ones. We strongly advise you against trying to service or replace your garage door springs yourself. Our technicians are trained to safely disconnect these components so that any pent-up tension isn’t dangerously released. If not properly handled, one of these springs can easily cause damage to people and property around it. Don’t be tempted to try it yourself - call the experts. Our technicians will work quickly to deliver a solution that gets your overhead door working again as soon as possible. Contact Garage Door Repair Ramona today to find out how we can help you!